INDORE, India - Jan. 18, 2019 - PRLog -- "High prevalence of oral cancer will augment oropharyngeal market"
Global oropharyngeal cancer diagnosis and therapeutics market is expected to grow at a noteworthy growth during the forecast period 2018-2023. The market is augmenting due to rising prevalence of oropharyngeal cancer, growing unhealthy lifestyle of people and increasing geriatric population base globally. The global oropharyngeal cancer market has been segmented by diagnosis type, treatment type and end user. The report provides detailed and insightful chapters which include market overview, key findings, strategic recommendations, market estimations, market determinants, key company analysis, market insights, company profiling, market segmentation, geographical analysis, and analyst insights of the market. Oropharyngeal cancer is the disease in which formation of the malignant cells takes place in the tissues of the oropharynx. As per American Medical Association, about 410,000 incidences of lip and oral cavity cancer were reported in 2015 globally. About 146,000 fatalities were reported due to the same in 2015. In the US, around 51,500 incidences of oral cavity and oropharyngeal cancers were reported, and 10,050 mortalities are expected in 2018 due to this cancer. Its incidence has been rising partly due to result of human papillomavirus (HPV) growth. Rising incidences of HPV related cancers has been one of the major factors driving the market growth. As per WHO, cancer of the oral cavity ranks was recorded as among the three most common types of cancer in south-central Asia. The age standardized incidence rate of oral cancer in India is 12.6 per 100,000 population year on year basis. Additionally, improvement in the healthcare expenditure will support the growth of the treatment in these countries. Rising geriatric population is driving the market growth as oropharyngeal cancer is most common in people aged more than 60 years. Though, the median age of people diagnosed with these cancers is 62 years, they can also occur in younger people. Rates of these cancers vary among different countries. As an instance, as per American Medical Association, it is the second most common cancer in South Asia countries such as India, Pakistan, Bangladesh, and third in Nepal whereas it is 14th common cancer in France, 18th in Germany and 19th in the UK. High prevalence of smoking tobacco and alcohol consumption has been motivating the market. All forms of tobacco such as cigarettes, cigars and pipes along with alcohol usage increase the risk of oropharyngeal cancer. As per WHO, around 1.1 billion people smoked tobacco in 2015. Additionally, more than 2 billion people consume alcoholic drinks globally. Moreover, non-smokers being exposed to passive smoking are also prone to oropharyngeal cancer. There are more than 4,000 chemicals in tobacco smoke from which 250 are harmful and more than 50 of them can cause cancer. This number of smokers and alcohol consumers has more risk of developing oropharyngeal cancer and enable the market growth. Additionally, reimbursement policies available for oropharyngeal cancer treatment have been the major factor in market's growth. Comprehensive research methodology of global oropharyngeal cancer diagnosis and therapeutics market. This report also includes detailed and extensive market overview with current market recommendations & key analyst insights. 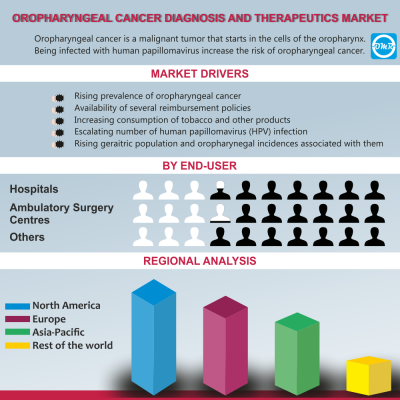 Analysis of regional regulations and other government policies impacting the global oropharyngeal cancer diagnosis and therapeutics market. Insights about market determinants which are stimulating the global oropharyngeal cancer diagnosis and therapeutics market.